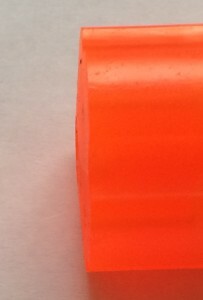 The slightly conical front face of a cylinder after machining. 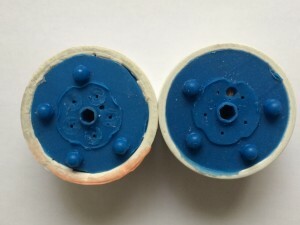 In Part 2 of my blog series The Making of the Wall-Saver safety cylinder, I told you about the rather elaborate preparations for making the silicone mold from which the first prototype was drawn. I documented the whole process with photos so that I could reproduce it easily if it worked as a well as I hoped. And it did work, more or less. 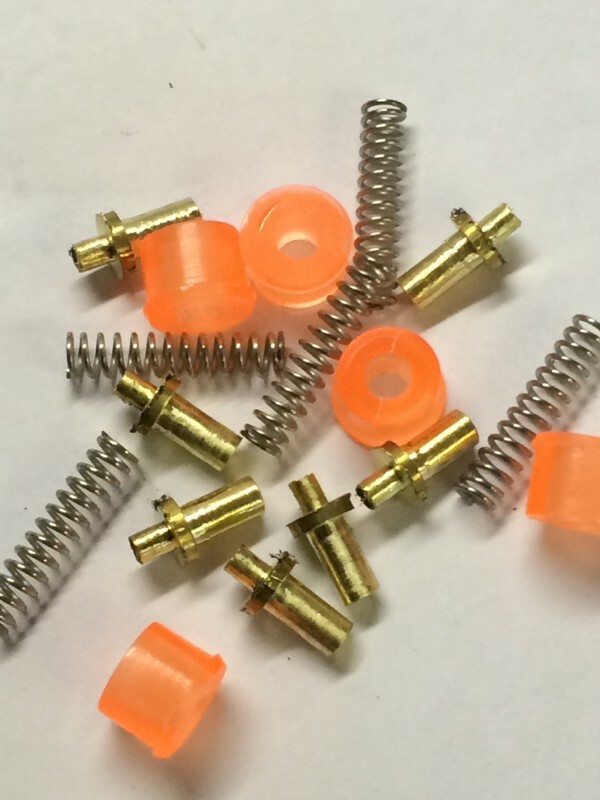 So now I just needed to stick brass, springs, and plastic inserts into the chambers and I’d have a working cylinder. Except. The live cylinder makes a pretty tight fit with the forcing cone at the back of the barrel to pass the hot combustion gasses down the barrel. That was unnecessary for a plastic cylinder, and the front wasn’t particularly aesthetically pleasing due to the uneven clay I had used to stuff the chambers. In addition, as I made more prototypes, I found that the cylinder cores were sometimes unduly hard to extract, because they didn’t sit flush against the bottom of the mold, allowing plastic to seep around them and trap them. That sometimes called for work with a knife or end mill or Dremel tool to clear away the offending plastic. The two top parts of the original mold. On the left, the original, with a working sprue and vents, and an ugly face. On the right, a neatly trimmed version…with plastic permanently blocking the sprue. The first problem was easy to solve; just mount one of the cast cylinders on the rotary table of the mill, and mount that on the adjustable angle plate tilted a few degrees from vertical, and mill the front surface of the cylinder back a little bit. With a couple detours through “turn handwheel wrong way and gouge” and “try to use epoxy to fill gouge,” and “give up and cast a new one” it wasn’t long before I had a new master to insert into the old bottom half of the mold and pour new top half. Without a sprue. Hoo boy, now I need to cut a sprue through the silicone and plywood? Yes. So I did, and got exactly one cylinder out of it, because the polyurethane poured through the impromptu sprue soaked into the plywood and fused with it, meaning that sprue could never be used again. However, the cylinder proved to be functional, at least as far as fitting on the gun goes, so it seemed like it was nearly ready. I just needed to re-pour the top. However, I still had the “chamber cores are hard to extract” problem, so I thought perhaps the way to go was to make a mold where the chamber cores were made out of poured silicone rather than machined HDPE. But because cores at the bottom of a mold would be hard to spray with mold release (a lubricant designed to prevent cast parts from sticking to the mold), and I was concerned about damage to the mold, I decided to pour it upside down.